In this children’s picture book, a daring Chihuahua escapes through an open window and makes a new friend. Cutie, a curious canine, lives with her human “mom,” 6-year-old Ava Rose. Both wish that the girl could stay home and play, but she must go to school. One morning, Cutie gets bored with her same old puppy food and decides to find something more interesting to do (and eat). In the desert, Cutie meets a green, long-tailed lizard. 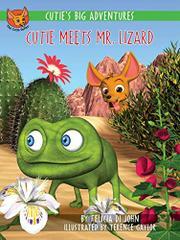 Once Mr. Lizard realizes Cutie is simply playing, not hunting, they become friendly, and he invites her home for lunch. Cutie doesn’t care for live ants, though, and wishes that she’d eaten her breakfast. After some games, Cutie gets home in time to greet Ava Rose and eat some now-appreciated puppy food. Debut author Di John develops an appealing idea: what adventures do our pets have when we’re not at home? Her story offers a good balance of danger and excitement on the one hand and friendly affection on the other. (However, adults should be sure to tell kids not to leave a window open for their pets.) Gaylor (Asthma Is Not Stopping Me, Featuring Fabulous Me, 2016, etc.) provides expressive, three-dimensional illustrations that give the book a cartoonish brightness and beautifully bring out the desert setting. A tale with vivid illustrations and an engaging dog protagonist.